The rapidly declining level of cooperation between Apple and Google has reached a new bottom - with Google CEO Eric Schmidt leaving the Apple Board of Directors due to significant conflict of interest disputes. This comes after a long progression of Google-product encroachment upon the Apple world of hardware and the resulting, ever-more public displays of antagonism. The two technology behemoths, once united in their battle against Microsoft, are now left battling each other. This reminds me a lot of the early developments of World War II - where the once united Nazi Germany and Soviet Union allowed initial conflicts of interest to become outright antagonism and eventual war. I won't guess as to which ally-to-enemy players of the past match the present - but it would be safe to say that late 1930s Poland is equivalent to the modern day mobile ecosystem. Logo placement is purely illustrative - no implications. If Germany and Russia had maintained their alliance, Germany would have been able to focus on the Western Front and WWII would have potentially had a different historic outcome. 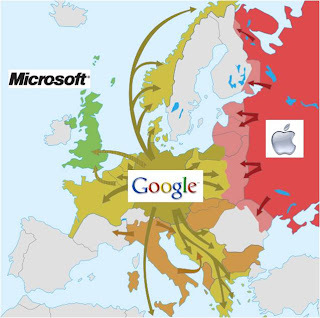 If Google and Apple had maintained their alliance - with Apple focusing on mobile/music and the Mac ecosystem while Google focused on the Internet and PC arenas - Microsoft would have potentially lost its position of PC dominance and significant mobile competitiveness. Now we are left with Microsoft (the U.S. or U.K.-equivalent of WWII?) laughing as its two worst enemies commit a historic mistake.